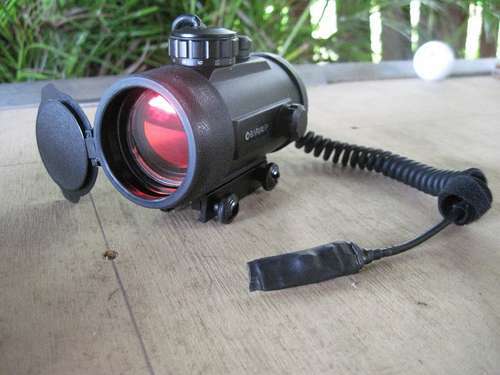 [Patman2700] has a nice scope for his paintball gun that uses a red dot instead of cross-hairs. The problem is that he kept forgetting to turn it off which ended up running the batteries down frequently. His solution to the problem was to get rid of the toggle switch used to turn it on and replace it will a home-made momentary push button switch. Now he presses the switch to aim and doesn’t waste juice when he’s running around, trying not to get pelted with paint. Since this is used outside he wanted it to be water-tight. The switch is built using materials we’ve seen in previous diy switches; adhesive-backed copper sheets for conductors, foam to keep them separated until pressed, and plastic as a support. Copper is applied to the plastic base, with a ring of foam separating the base from the second layer of copper. When squeezed, the two layers of copper come in contact to complete the circuit. To make it work a bit better [Patman2700] added a dab of solder in the center of the bottom copper layer so there is less distance between conductors, and used extra foam to build up a bump in the center of the assembly for a better ‘button’ feel. The whole thing is encased in shrink-wrap with the seams sealed with super glue to keep moisture at bay. isn’t shrink wrap something they use to wrap shipments. It kinda looks like sarand wrap. This looks more like a heat shrink tube. Too bad red dot sights are useless on paintball guns. Once again, I must speak of the true defensive abilities of the ice cream sundae. Oooh! I have a reflex sight for my Sig 556, and I lost the rubber cover for it. Normally thats not important, but the sight is light activated (and responds to different levels of light) meaning there is NO off switch! 100% doing this in the next few days! Its flexable and strechy after it dries/cures. All the paintball markers I’ve used have been so horrifically inaccurate due to the ball aerodynamics that any form of sight is utterly pointless, it’s +- 2ft at any range > 15ft. @biozz I used to be nuts about sights and wanted to be a paintball ‘sniper’. Even had a red dot (and even had problems with it being left on). $5 for an NcStar “pressure switch for red lasers” on Amazon gives you all the basics for cheap – just splice it in. If you’re not feeling the DIY spirit that is. Use a real switch, preferably a microswitch with click feel. Copper and solder make poor contacts and the sweat of hands will get to it before WX. What powers the laser? Tablet cells or a hamster wheel? Any combat worthy power should hold up for hours, or be behind the trigger-light pull. Super glue is not a good choice for this because it is not flexible. The join will eventually crack with flexing of the tube and allow moisture in. Still a pretty cool build, it’s just a matter of slight refinement. This is often true, unfortunately. The problem that too many people oversee is that the most important aspect of a paintball setup is the paint/barrel match. Though paintballs are .68 caliber, there is a MAJOR difference between manufacturers. (i.e. .684, .682, .685, etc.) This leads to either the ball bouncing around the barrel on its way out, or a lot of broken paint coming out the end. The rub lies in paint selection. Try a variety of manufactures’ paint, dropping one by one down the (detached) barrel. If it simply falls through, it’s too small. If you cant get it through, it’s too large. You should be able to get it through by softly blowing through the barrel. Don’t forget, the dot should turn on BEFORE the trigger is pulled, to be able to line up the shot. Also, if you were to use a microswitch, then a) it would be even MORE susceptible to sweat and dirt, and b) the copper contacts are sealed inside a length of heatshrink tubing. It’s watertight. The problem with battery life (as I mentioned above) is that I’d forget to turn it off when either between games or putting it away. Sure, the battery may last 10 hours+, but not 48 hours+. I would have used epoxy, plasti-dip or similar to seal it instead of superglue based on years of using superglue for the wrong purpose (it’s made for cuts and works great for that!). I would also stay away from copper and solder switches, try plating the copper with silver and then reducing the thickness of the foam to get a nice reactive switch that won’t easily wear/corrode. I think echodelta meant using a microswitch inside heatshrink like you did. That said, ALL switches are prone to failure. So I don’t think either option is much better/worse. You’re absolutely right about the super glue. Lemme edit the Instructable to recommend something else. Earlier, in reply to Mr. AK74, you said that forgetting to turn it off was the problem. Well, that isn’t a paintball gun, you should treat that more carefully… lest you forget to unload and clear the chamber the next time you clean it! A better way to go would be to use cheap simple encapsulated reed switch with an external magnet trigger button.